Taho corresponds to number 9 on the Gohonzon Diagram. 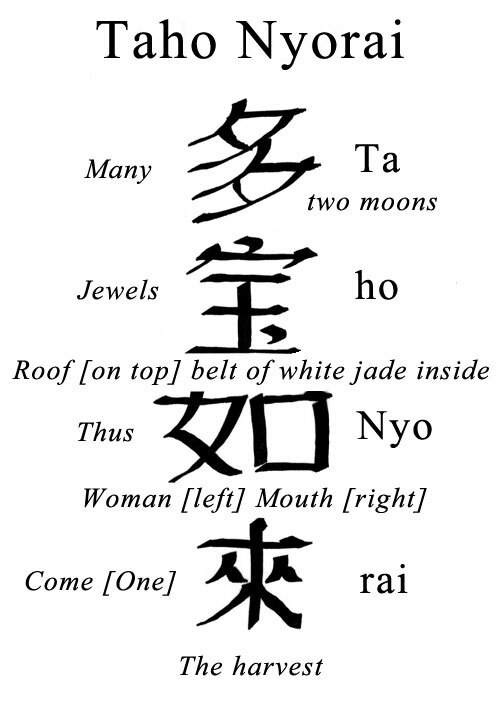 Ta (to) is a repetition of two radicals — both are images of the visible moon and the unseen moon (the little tail at the bottom is the unseen moon). Ta is a repetition of that which is seen and unseen. When Taho appears in the Treasure Tower, he joins Shakyamuni and they recite the Lotus Sutra together in the Ceremony in the Air — a repetition of the seen and the unseen (Ta of Taho). The Ho of Taho is Pao in Chinese. It is composed of two radicals. The radical on top is a roof. And under the roof is a string of rare white jade. Nyo is the first character of the 16th chapter of the Kumarajivan Lotus Sutra. It is composed of two root characters. On the left is the radical for woman. It is the left part of Myo of Myoho-renge-kyo. On the right is the radical for mouth. Nyo is used in the Hoben Pon (second chapter of the Lotus Sutra) to mean "like" or "as such" in the section that is repeatedly three times in Gongyo: Nyo Ze Sho, etc. 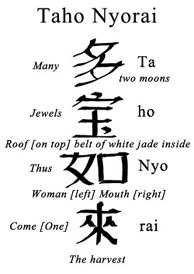 Nyo means "women's speech" in Chinese, because it was believed that a woman's virtue is that she could speak to the capacity of the listener (instead of being direct), words like "as such", "like," or "thus" were the words of women — women's speech. In this case it means "Thus." Rai is the image of barley at the time of harvest. Because of the anticipation of the harvest, Rai means "to come" or "to arrive." Namu Taho Nyorai means "Devotion to Many Treasures Thus Come One." When we repeat (as Taho does) the 16th chapter of the Lotus Sutra, we reveal the treasures of our life. These treasures are both visible and invisible. . . Like the moon, which is both seen and unseen. Like jade in a house. The Treasure Tower is our life itself. "In essence, the appearance of the Treasure Tower indicates that the three groups of Shakyamuni's disciples attained enlightenment only when they heard the Lotus Sutra and perceived the Treasure Tower within their own lives. Now Nichiren's disciples are doing the same. In the Latter Day of the Law, there is no Treasure Tower other than the figures of the men and women who embrace the Lotus Sutra. It follows, therefore, that those who chant Nam-myoho-renge-kyo, irrespective of social status, are themselves the Treasure Tower and likewise they themselves are Taho Buddha." —Major Writings, Vol. 1, p. 30, "On the Treasure Tower"
The seven jewels on the Treasure Tower are the senses that perceive the objective world. For this reason Taho represents objective reality and Shakyamuni represents subjective wisdom. "The true aspect of all phenomena indicates the two Buddhas Shakyamuni and Taho [seated together in the Treasure Tower]. Taho represents all phenomena and Shakyamuni, the true aspect. The two Buddhas also indicate the two principles of the truth as object and the wisdom to grasp it. Taho signifies the truth , as object and Shakyamuni, the wisdom. Although these are two, they are fused into one in the Buddha's enlightenment." —Major Writings, Vol. 2, p. 229, "Earthly Desires are Enlightenment"